In January 2001, the Garden's EarthWays Center helped launch a local chapter of the U.S. Green Building Council, the Missouri Gateway Chapter. Our shared work advances the Garden’s mission to protect plants by promoting life style choices that reduce human environmental impacts. USGBC-Missouri Gateway Chapter strives to integrate sustainable design, construction and operating practices throughout the region’s building stock. The chapter now has over 600 members representing all elements of the building industry. Chapter headquarters and two full-time staff are housed within the Garden’s Commerce Bank Education Center. Learn more. EarthWays Center also partners with the Homebuilders Association of Greater St. Louis, with staff serving on the HBA Green Building Council Steering Committee. As local Residential Green Building Advocate for the HBA and USGBC, we educate homeowners and homebuilding industry professionals about the health, economic and environmental benefits of Green building and remodelling. We promote use of certification systems including ENERGY STAR, LEED-Homes and the NAHB ANSI Standard. 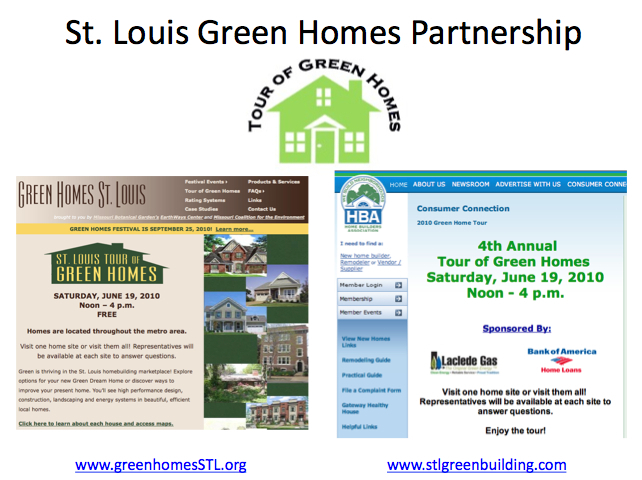 Major public education events include the annual St. Louis Tour of Green Homes, the HBA Home and Garden Show, and the Garden's own Green Homes & Great Health Festival. The Building Performance Institute (BPI) is the nation's leading organization certifying highly trained professionals for residential building analysis. The Missouti Botanical Garden is a BPI Test Center. This means that our own rigourous systems, BPI certified personnel and our history of work in this realm has earned us the Test Center Designation. We are, in this role, providing training and proctoring services to the entire metropolitain area in order to grow our region's green workforce. This workforce will provide home energy assessments that rigorously test for safety, durability and energy efficiency. We have many BPI Professionals in the region and we are grateful to add more to the mix. Please go to www.bpi.org for additional details.